District of Sechelt recognizes the need for affordable housing to support residents at various stages of life. Secondary suites contribute to the community by providing accessible rental housing, lowering property ownership costs and providing in-law residences for family members who need at-home care. In light of this, the District of Sechelt permits secondary suites in all residential and rural zones. • The property must allow for three (3) off-street parking spaces (2 are required for the primary residence and 1 for the secondary suite). • Secondary suites are limited to a floor area of no more than 40% (or 90m2, whichever is less) of the home. • A house with a secondary suite must be owner-occupied for a minimum of 9 months of the year. 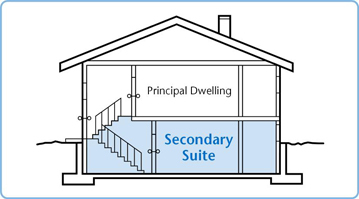 For more information on Secondary Suite requirements, contact the District of Sechelt Planning Department by email or click on the Quick Links.